Moses Fleetwood ("Fleet") Walker was born in 1857, the son of parents of mixed race, which automatically classified him as "African American" for legal and social purposes. His father was a blacksmith in Mt. Pleasant who later moved to Steubenville, trained as a physician, and became a respected practitioner. After practicing in Steubenville for a number of years, Dr. Walker became a minister and moved his family to Oberlin, Ohio, which enabled his sons Moses and Weldy to attend Oberlin College, one of the few institutions of higher education at the time which admitted African American students. The Walker brothers excelled at baseball and played on the college baseball team while attending Oberlin College. In 1883, Fleet Walker played baseball professionally with the Toledo Blue Stockings (forerunner of the Mud Hens), in order to make money to pay for his law school tuition at the University of Michigan. In 1884, the Blue Stockings joined the Major League sanctioned American Association, making Mr. Walker the first African American to play in the Major Leagues. Mr. Walker played until 1889, for teams in Cleveland, Waterbury, Syracuse, and Newark. Several other African Americans, including Fleet Walker�s brother, Weldy, played Major League baseball during this time frame, in the face of mounting sentiment that Major League baseball should be open only to white players. 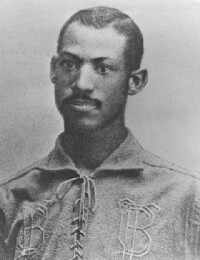 By 1889, Fleet Walker was the only remaining African American Major League player. When he left the game during that season, an unwritten agreement among owners and players resulted in an absence of African American players in the Major Leagues until Jackie Robinson broke the "color line" in 1947. Following his baseball career, Mr. Walker lived in Syracuse, Cleveland, and Steubenville, where he worked as a postal clerk and as a hotel operator. He also became an inventor and received patents for an exploding artillery shell in 1891. Mr. Walker and his brother Weldy published The Equator, a newspaper dedicated to African American issues and causes while residing in Steubenville in the first few years of the Twentieth Century. Fleet Walker and his wife Ednah moved to Cadiz in 1904. They took over operation of an opera house which was located in the building which still stands today in the 100 block of West Market Street, across from the Harrison County Courthouse. They resided in an apartment on the upper floors of the building. In 1920 Ednah Walker passed away, and in 1922 Mr. Walker sold the opera house and moved to Cleveland, where he lived until his death on May 11, 1924. Moses Fleetwood Walker is buried in Union Cemetery, Steubenville, Ohio. Sources: This information is adapted from the Harrison County, Ohio, History/Heritage Page. See also: Moses Walker via the Baseball Hall of Fame. The image shown above is courtesy of the Baseball Hall of Fame.